A multicoloured sign on a Bradshaw Primary School wall is a constant reminder of the school’s anti-bullying mantra: Don’t Stand By! Stand Up - Stand Strong - Stand Together. The sign joined banners promoting kindness and peace during the Alice Springs school’s observance of the National Day of Action against Bullying and Violence on February 22. The school’s 450 students produced the banners, and the cut-out hearts that were attached to a collective mural. Principal Penny Weily said the anti-bullying event involved 20 classes in the creation of banners, buddy classes based on Bullying No Way resources, and kindness awards. “The school has been involved in the National Day of Action against Bullying and Violence since 2011,” she said. “The core of our approach is to encourage students to speak to an adult if they feel bullied, and not to standby while others are harassed and intimidated. 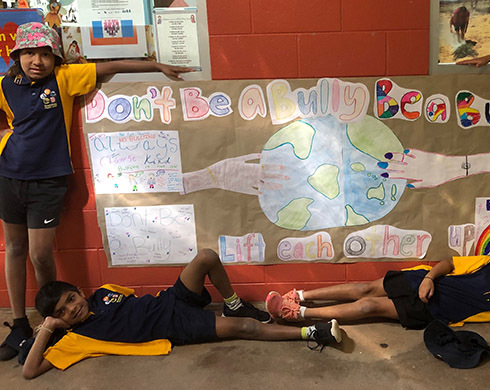 “We had a whole school competition, challenging classes to come up with a slogan that we could paint on a concourse wall to remind students they have options when they encounter bullying. The Don’t Stand By! Stand Up - Stand Strong - Stand Together slogan was adopted. The ninth National Day of Action against Bullying and Violence will be held Friday 15 March 2019.